John Piermarini outside Crop Circle Kitchen in Jamaica Plain, where his Sweet Idea company turns out $5 packs of cookies for delivery nightly by bicycle. “If you were given $1 million, what would you do with it?” That simple question was posed by John Piermarini’s fifth-grade teacher, Ms. Ferrell, in Acton. Classmates planned extravagant vacations or donated their wealth to charity. Piermarini, who was fascinated by kitchen equipment and enthralled with his childhood hobby of baking, had a pretty sweet idea. Last year, Piermarini, 25, rolled out — literally — an iteration of his dream project. In the evening and into the wee hours, from Thursday through Saturday, Piermarini and a small team of students can be found on bicycles, roving Boston-area campuses with freshly baked cookies. 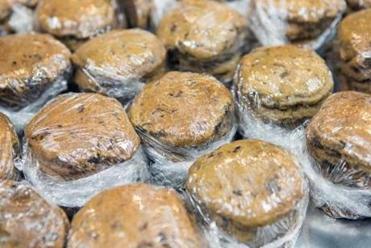 The company, Sweet Idea, delivers plastic-wrapped $5 bundles of treats that have been ordered online or by text message. 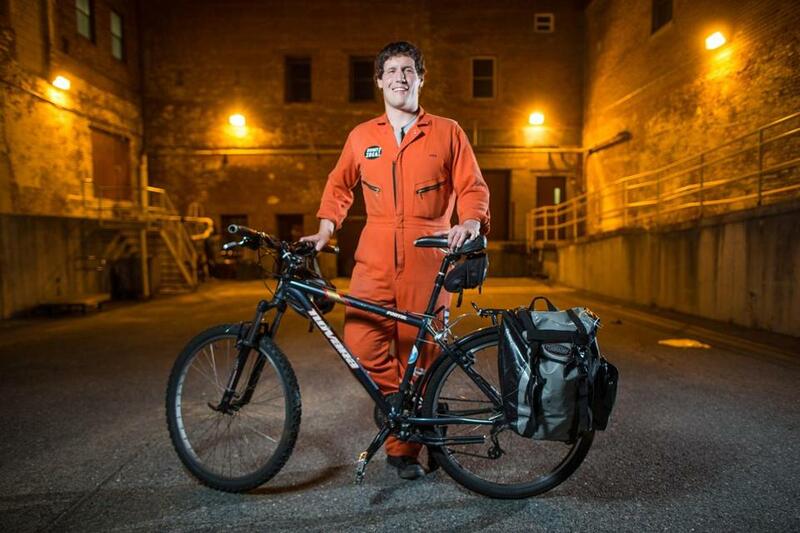 The bikers are dressed in bold orange jumpsuits, so they are hard to miss. The brand, says CEO Piermarini, who resembles an ever-so-slightly stockier version of the comedian Andy Samberg, “is spreading happiness and associating with just having a good time.” To that end, he only hires upbeat riders. 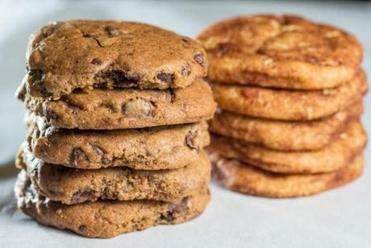 Cookies are baked in the Jamaica Plain shared-use space, Crop Circle Kitchen. One of the perks of being a start-up there is bartering with other companies. “There’s a lady who makes some great salsa,” says Piermarini. “I’ve got a deal with her.” Exchanging snickerdoodles for salsa and other specialty foods helps when eating on a tight budget. “Roxy’s will hook me up pretty often,” he says. That means he gets a regular supply of leftover Iggy’s bread from the grilled cheese food truck to use for peanut butter sandwiches. One reason friends are surprised by Piermarini’s entrepreneurial endeavor is that he walked away from a steady job. After three summers interning with IBM while he studied computer science at Rochester Institute of Technology, he got a software engineering job with the company. Not long after starting, he revisited the idea of the cookie delivery business. With not much to show after a year-and-a-half of planning, he decided to take a leap. Piermarini recalls thinking, I’m not going to push for this unless I make myself push for this. It was also at RIT that he started wearing the signature work suit. A friend unearthed a bright orange jumpsuit in a dumpster dive, and said, “You should wear this when you deliver cookies.” Piermarini decided it would improve his visibility at night, “as well as attract customers to the sheer wackiness of [the business].” Now that Sweet Idea is off and running, the jumpsuits are part of his schtick. Piermarini is finally living out a version of his childhood dream. Only the $1 million is missing. Barbara Booras can be reached at bbooras@gmail.com.